For every presidential election since the year 2000, Slate.com does something incredible. The website lists who every single one of their employees, including staff not involved in content creation (and even interns! ), are going to vote for in the coming election. While this is commendable, this is not why I find the feat to be impressive. I find the feat to be impressive considering what it reveals about Slate.com. in total, Slate employees have voted Democrat 162 times, Republican 12 and third party 10. It is worth noting that Slate does not define itself as a partisan, ideological political outlet but in their words as “a general-interest publication offering analysis and commentary about politics, news, business, technology, and culture”. I wanted to see if Slate was unique in their levels of partisanship, so I had to do some scavenging. Unfortunately, no media outlet other than Slate has published their staff voting record. Without stating each employee’s political ideology at other media outlets, I had to discover people’s revealed political preferences by other metrics. 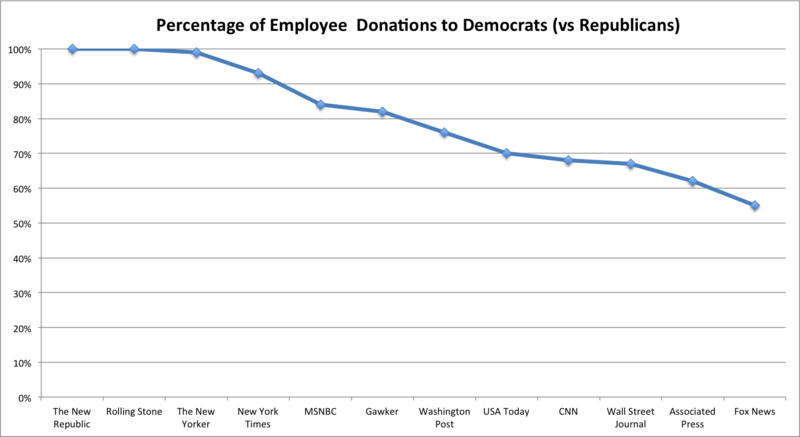 I decided to look up all political donations by employees at various media outlets. Almost all political donations over $200 since the year 1990 are listed online, so I decided to use those parameters. This includes all employees at the media outlet and not just those involved in creating content. 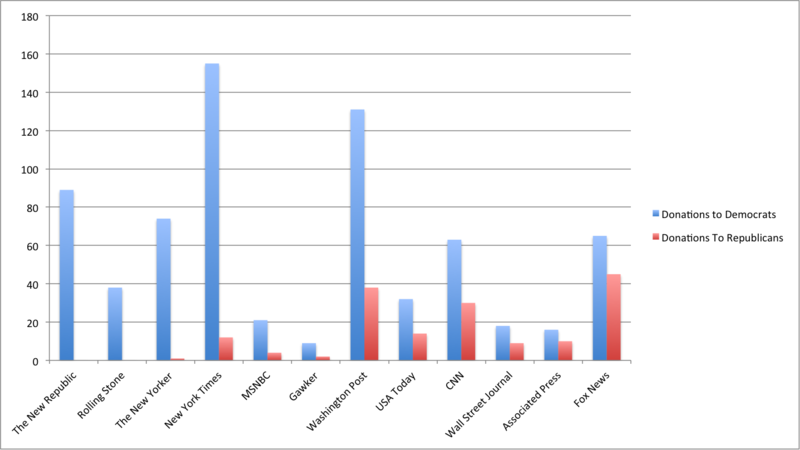 Moreover, only a small amount of Americans donate to political causes, so this is only a small sample of the entire media organization. Lastly, donations can vary in size, so the total number of donations might not accurately capture how much an individual/organization actually contributed to a cause. Despite all the qualifiers, I found the results to be shocking; political partisanship is far higher than I ever could have anticipated. The first chart displays what percentage of political donations by that company’s employees went to the Democratic Party. The second chart shows the amount donations made in total by their employees to both parties. My first takeaway is the shock at how much these companies really favour the Democratic Party. Forgetting the homogeneous results for institutions that everyone knows are liberal such as the New York Times, the New Yorker and the New Republic, even Fox News, the supposedly most bias media outlet and cheerleader for the Republican party still as an organization has higher support levels for the Democratic Party than Republicans. The second takeaway is how partisan some of these institutions are. The New Republic, New Yorker and New York Times are all significantly smaller than organizations such as the Wall Street Journal, Associated Press and CNN, yet there are significantly more donations per employee to political causes. The amount of donors is important because it reveals how many employees are actively rooting for one specific political side to win, making it far harder to mitigate fears of bias. Thomas Schelling, the 2005 winner of the Nobel Memorial Prize of Economic Sciences ascertained that the near total segregation of white and black housing communities in the United States is not due to America being filled with racists who wanted to live in segregation, but the unintended consequence of benign, individual choices. A similar principle likely applies with the hiring practices of nearly homogenous companies such as Slate. In the American housing market, the desire to not be a small minority in one’s community proved to lead to near complete segregation. As people do not want to be a small minority in their community, any area where a large majority already exists, the minority population starts to move out. Similarly, no newcomers want to move into a community where they would be the small minority and instead choose to move to different areas. This leads to all minority groups desiring to leave their community for one where they are not in the minority, consequently growing a majority in another location and compounding this effect. Overtime, this lead to the non-racist individuals living in communities completely segregated by race. Slate and other media groups likely would prefer to have greater ideological diversity, but suffer from a similar problem to housing segregation. For each prospective hire, these publications likely have a slight preference for those with similar viewpoints (or against those with heterodox viewpoints). As each hiring decision is done on an individual basis instead of a collective strategy, each new employee ends up having a similar viewpoint, until all employees end up sharing similar views overtime. Similar to racial segregation, the slight preference for hiring those with similar viewpoints on an individual level eventually leads to complete ideological segregation. In the internet era, there has been a foundational shift in news media. Previously, news was about new information being reporting. Online publications have shifted to a model where columns are essentially the extension of a writer’s blog/twitter account and most published articles are a crossover between an editorial and a news story. I am not going to opine here on why I think media bias is a bad thing or the negative consequences of such a hivemind, but I will say that as we move forward in the digital era, expect the polarization to increase.